[tps_footer]Aishwarya Rai Bachchan and Randeep Hooda are all set to flaunt their mind blowing acting skills in the biopic ‘Sarbjit’. The film which is already in the limelight for its sensitive plot and story line has finally unveiled its first poster. Directed by Omung Kumar the film is highly awaited by the masses for its intriguing concept. 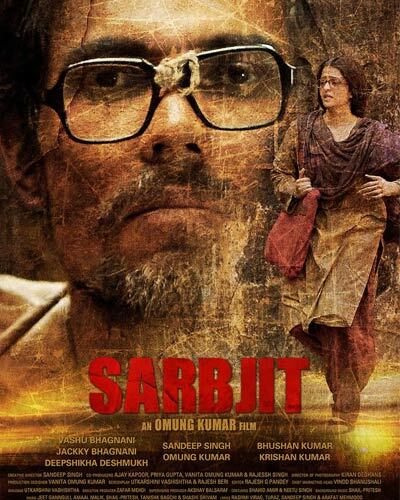 The first poster of the film ‘Sarbjit’ is highly serious. Depicting the backdrop of a crumbled like scenario, the poster sees Randeep and Aishwarya in an intense mode. Randeep who will be seen in the principle character of Sarabjit Singh is highly focused in the poster. Additionally, gorgeous actress Aishwarya Rai is seen in a de-glam look in the poster too. With spectacles on and a baggy salwar kameez, the actress is nailing her character by all means. While Randeep Hooda will be seen in the role of Sarbjit, Aishwarya will portray the role of Dalbir Kaur (Sarabjit Singh’s sister). The movie revolves around the life of Sarabjit Singh, who was a farmer in Punjab. Sarabjit Singh’s life took an ugly turn when he was convicted for spying and terrorist related activities by Pakistan. Singh spent 22 years behind the bars in Pakistan and was then killed by the inmates of the jail.